Israel's supreme court has ended the Orthodox monopoly on conversions to Judaism in the Jewish state. The ruling allows gentiles who receive non-Orthodox training in Israel, but convert abroad, to qualify as Jews and therefore become Israeli citizens. It hands a partial victory to Reform and Conservative Jews, who have long pushed for more influence in Israel. The Orthodox tradition dominates Israel's religious establishment and receives generous state subsidies. The Conservative tradition and its more liberal Reform counterpart both observe Jewish laws, but believe in their evolution to meet modern needs. Until now, Israel has accepted non-Orthodox conversions performed abroad, but in Israel conversions must be performed by Orthodox rabbis if the convert is to be recognised as Jewish. Thursday's ruling centres on a 1999 case involving 17 foreigners who studied for non-Orthodox conversions, then went abroad for their conversions. They were not recognised under Israel's Right of Return legislation, the mechanism by which Jews are allowed to settle in Israel and receive Israeli citizenship. "It's a partial victory," said Rabbi Ehud Bandel, president of the Conservative movement in Israel. Mr Bandel had hoped the court would give blanket recognition to all non-Orthodox conversions performed in Israel. But one of Israel's two chief rabbis, Yonah Metzger, said the ruling ushered in a dangerous erosion of Orthodox control. Orthodox religious leaders fear the ruling may open an irreparable split in Judaism. "This is one of the hardest mornings in the history of the Jewish people," said Eli Yishai, leader of the Shas Party. 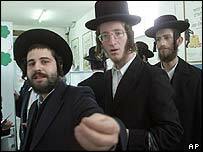 Non-Orthodox Jewish movements have been largely sidelined in the Jewish state although they are stronger outside Israel. The Orthodox establishment receives substantial funding from the state and has a virtual monopoly over marriage, divorce and burials. Orthodox rabbis believe other conversion processes do not set a high enough standard and some politicians fear that thousands of foreign labourers in Israel might now undergo lax conversions in order to qualify for citizenship and other social benefits.